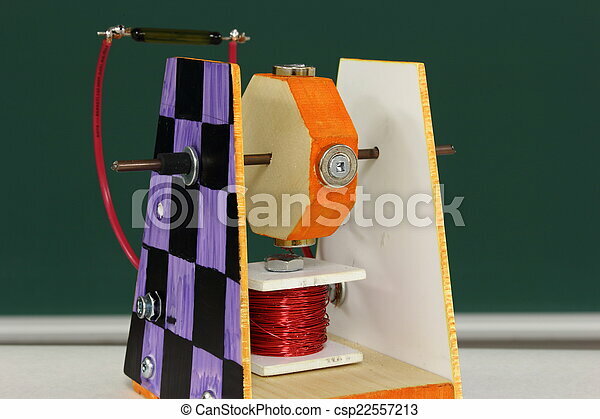 Student technology project: motor magnetic switch. 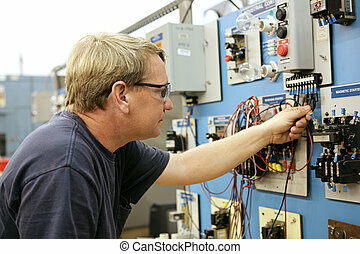 A vocational education teacher wiring a motor control board. 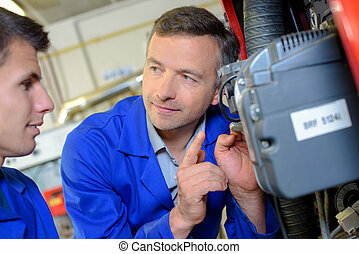 All work depicted is accurate and being performed according to national code and safetly regulations. 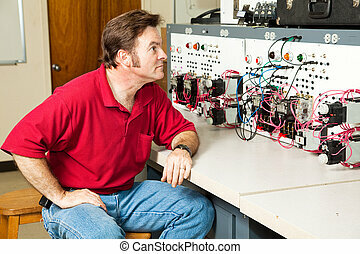 An electrical teacher working on an industrial motor control center in a classroom. 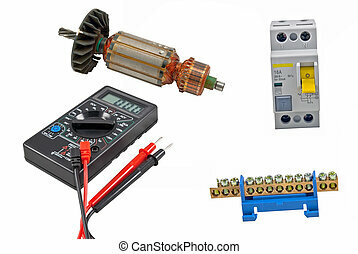 Magnetic starters with thermal relays connected by wires. Starters installed in electric Cabinet. 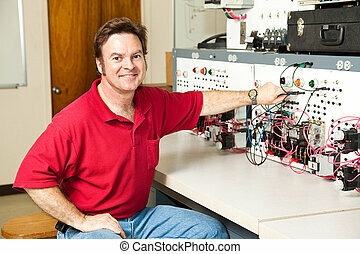 Monitoring relay phase circuit breaker motor protection. 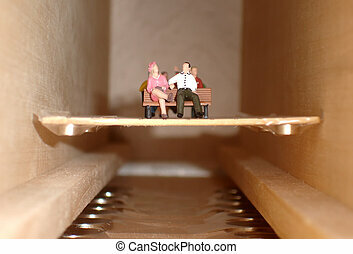 Wire laid in the cable channel. 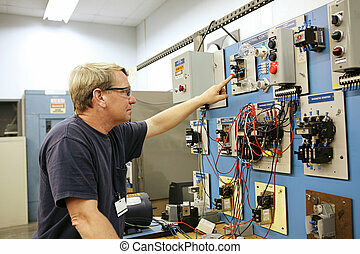 An electrician in a technical education class standing beside a motor control training board. 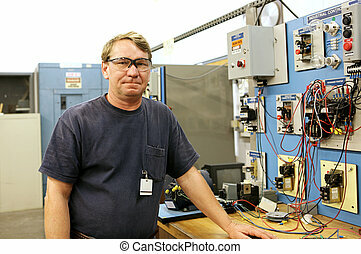 Actual electrician with real equipment according to national code and safety standards. Two magnetic contactor connected in reverse starting Assembly. 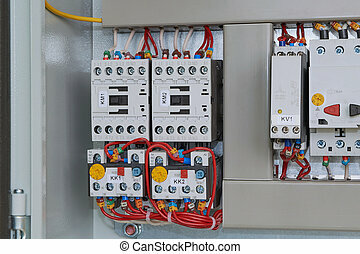 Wires are connected to contactors and additional contacts according to the scheme or project. Modern production of electrical cabinets. 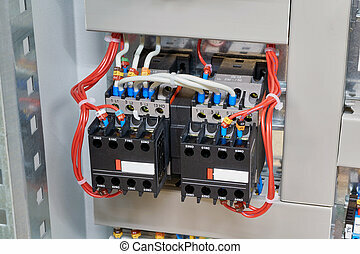 On the mounting panel are the power circuit breaker and circuit breaker protection of the motor. 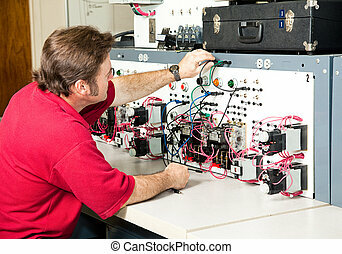 Preparation and placement on a circuit Board for Assembly of a new electrical Cabinet. 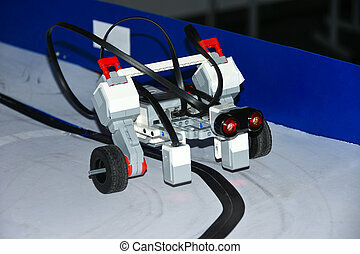 Students code car robot and an electronic board. Robotics and electronics. Laboratory. Mathematics, engineering, science, technology, computer code. STEM education. 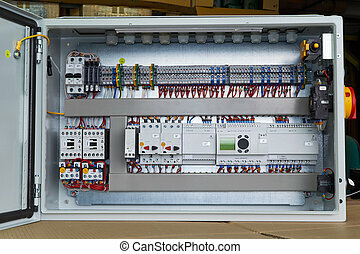 Modern electrical control Cabinet with controller and circuit breakers. Motor protection switches. 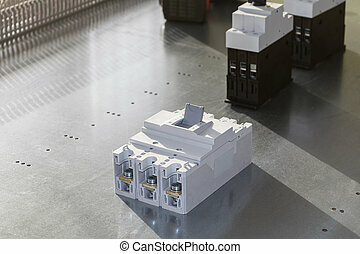 Contactors with thermal relays. Fuse-operated breakers. Through terminals. Connecting wires.